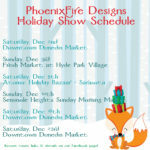 As always, check out our PhoenixFire Designs Facebook Page for more event details. 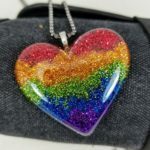 And, if you can’t make it locally to one of our shows, you can always shop the PhoenixFire Designs Etsy Shop 24/7 – we ship worldwide! Thank you for shopping small and supporting handmade this holiday season! I am facing surgery and a lengthy recovery time for a SLAP Tear – and I need your help. 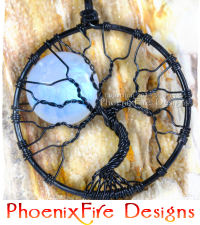 As you likely know, I own PhoenixFire Designs where I make handmade-from-scratch jewelry, including my signature wire wrapped tree of life pendants since 2006. You might not realize I’ve actually been making jewelry a lot longer than that – all the way since 2001! In 2011, I made the leap and decided to run PhoenixFire Designs full time. 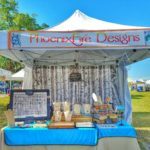 My online storefront + the couple dozen in person art & craft shows I do a year make up 100% of my income. But making jewelry has taken a toll on my body. Last Fall, I started having extreme pain and weakness in my left shoulder and arm. It went on for months and finally May of this year, I went to an orthopedic doctor. Initially, he felt it was a repetitive stress injury; rotator cuff tendinitis and shoulder impingement. 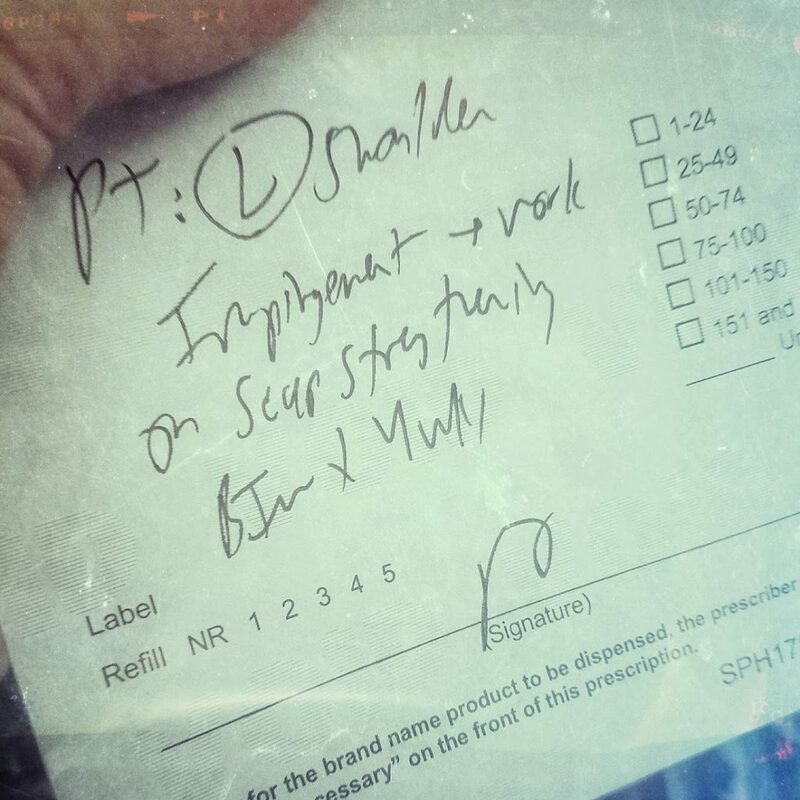 He sent me off for physical therapy. I worked hard for 8 weeks; 2x/week with my therapist and continued work at home as well. But it only gave me a small bit of relief. It was time for further testing. 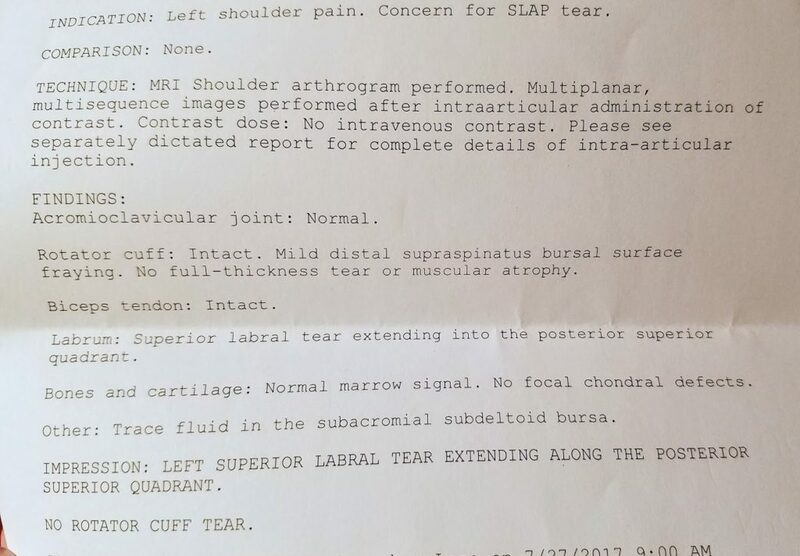 Radiology report from my mri arthrogram. Findings? 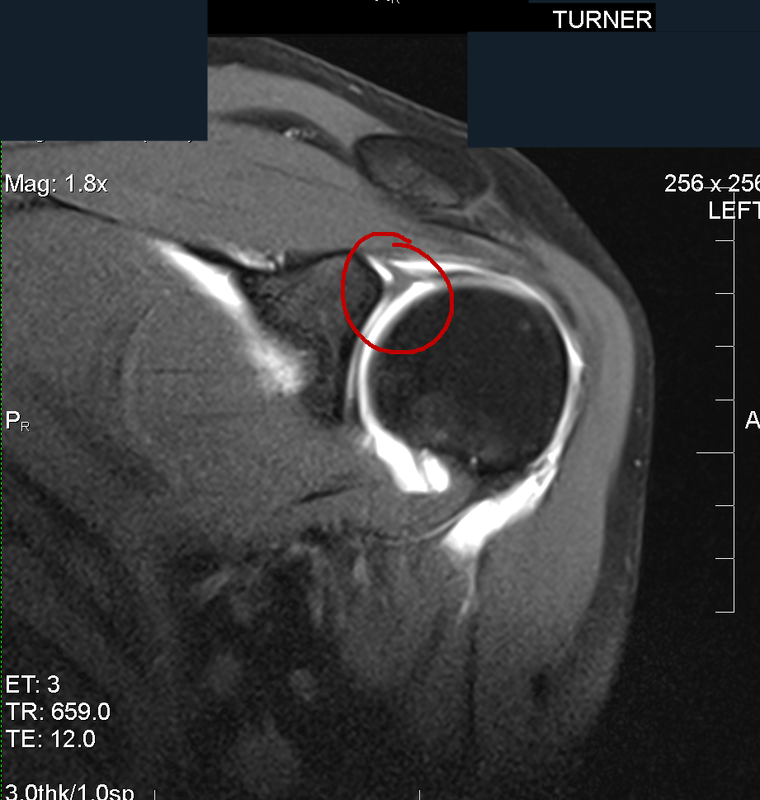 Left superior labral tear extending along the posterior superior quadrant. I’ve already had a cortisone shot as well as physical therapy. Surgery to repair it is my next step. SLAP tear surgery is a difficult and extremely life altering recovery. Overnight, I will essentially be one-armed. I will be in a sling 100% immobilized for between 3-6 weeks. It will be a minimum of 3 months (to as much as 6 months) of down time. I won’t be able to drive, I won’t be able to work, I won’t be able to use my arm in any capacity. The problem is that I work for myself. 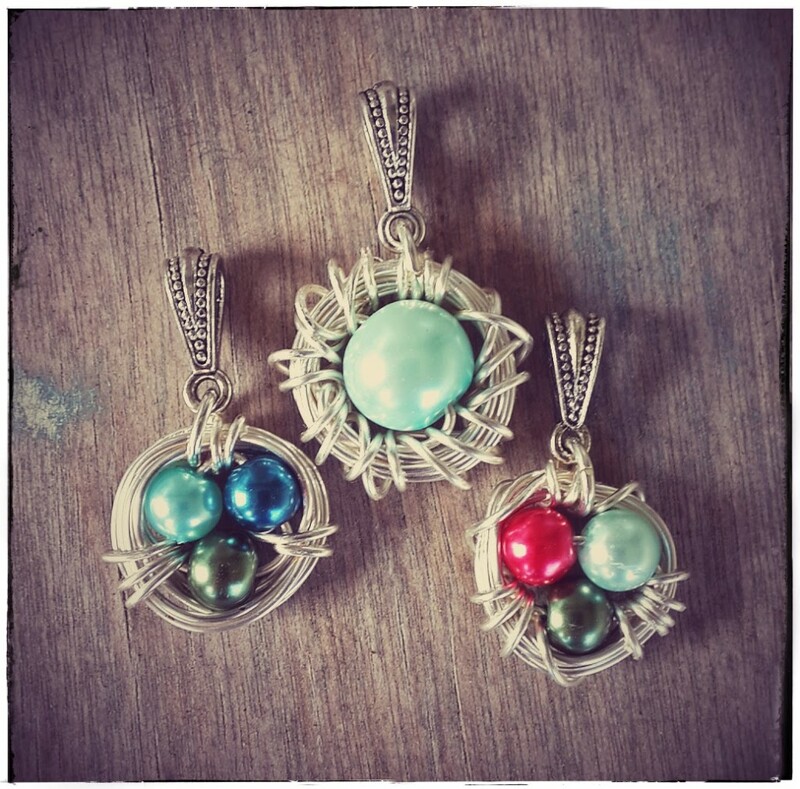 If I cannot make jewelry or physically participate as a vendor in shows, I have zero income. A minimum of three months without income is impossible for me to survive on my own. While I DO have health insurance, actual surgery costs are only one tiny part of the entire process. So, on the recommendation of my friends and family, I am starting Go Fund Me to help raise money so I can have my surgery so I can get better and stop being in pain all the time. It currently vastly limits me and I’m just so tired of hurting. As terrifying as surgery sounds, being in pain forever sounds worse. Anything you can do to help boost the signal – share my shop link, share my facebook page, get a jump start on your holiday shopping by putting in an order now, getting items from my surgery wishlist, or sharing my gofundme link, or even donating to my gofundme – all of it is so greatly appreciated. Thank you to everyone who has supported me and PhoenixFire Designs these past 16 years. With a little help and a little luck, hopefully, I can have another 16 successful years too. My po box for mailing purposes. What to bring for your first vendor show? What do you need when you’re doing a show, farmer’s market, or craft fair? There’s so much to remember, it can be hard to keep track of everything you need. Whether this is your first show or you’re a seasoned vendor, this guide is to help give you ideas of what to bring for a successful show. dolly or flat rolling cart (I have this one since it folds flat) or utility wagon for transporting items from car to booth. 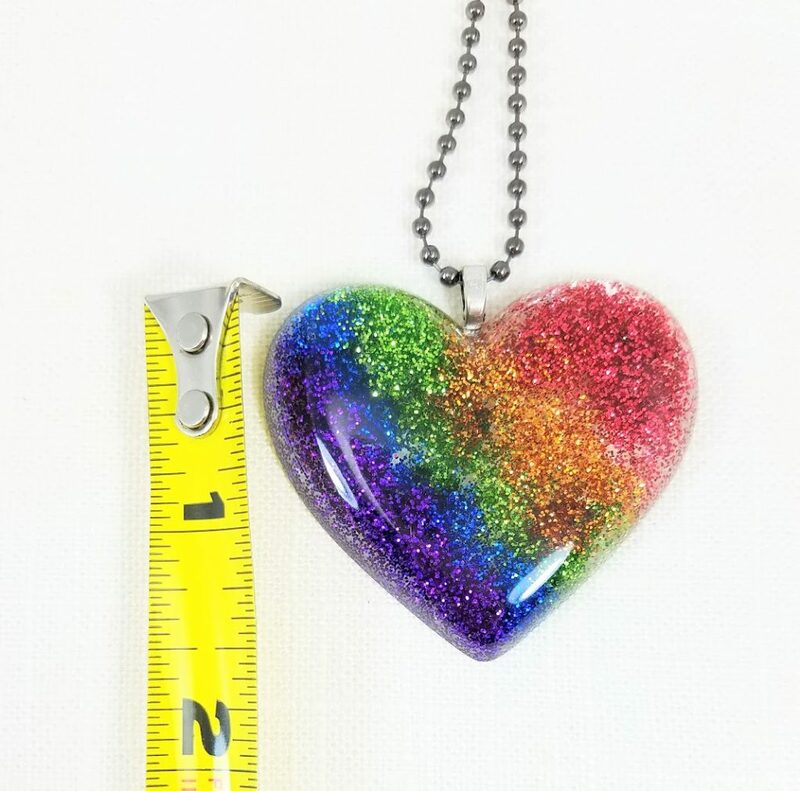 Also check out part 1 of new vendor guides: So You Want To Vend at Craft Shows? (Part One: Basic Supplies – Tent) which discusses how to select a tent, what to look for, how to use tent weights effectively and suggestions of items I like and use. Like what you see? 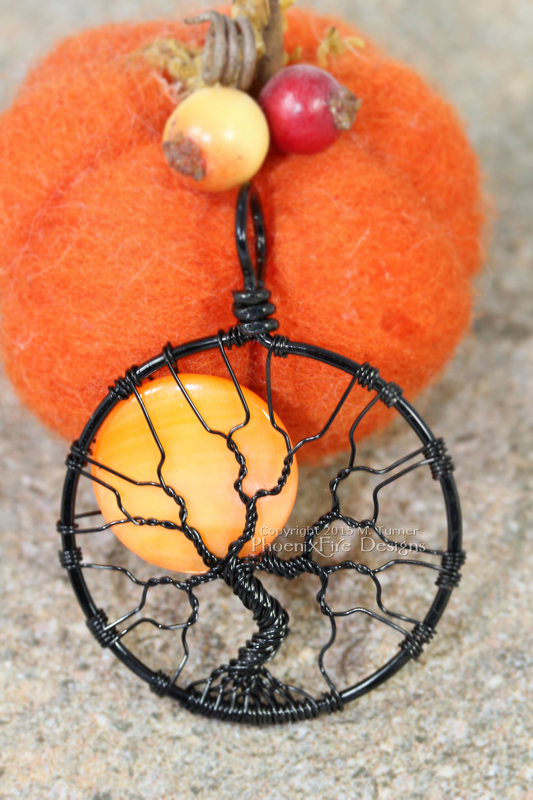 Check out PhoenixFire Designs on Etsy to shop our 100% handcrafted from scratch wire wrapped jewelry. 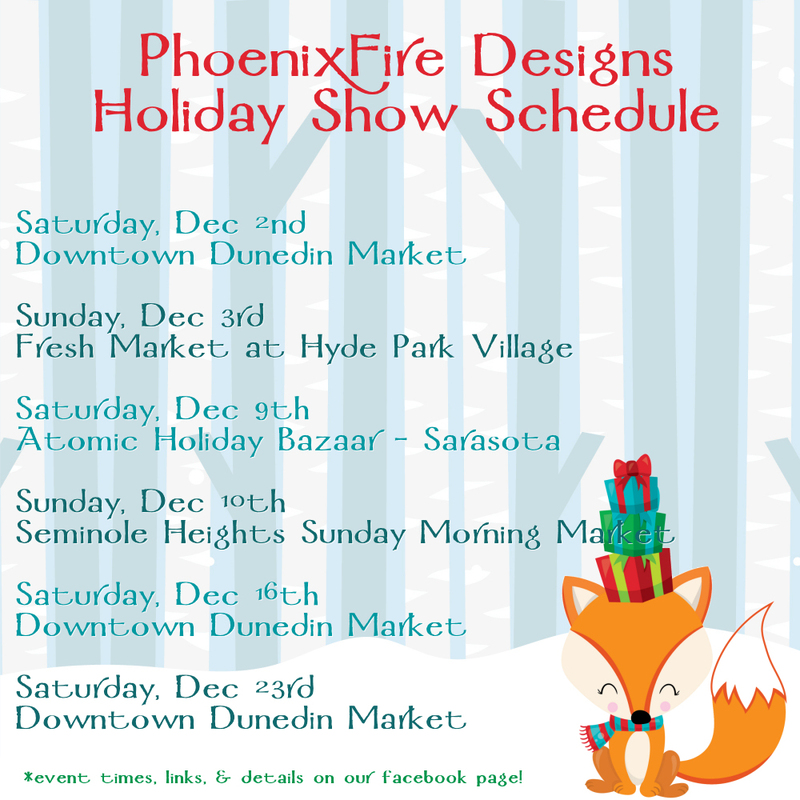 Don’t forget to like PhoenixFire Designs on facebook to keep up with our in-person shows and events and follow us on instagram to see what we’ve been working on lately! 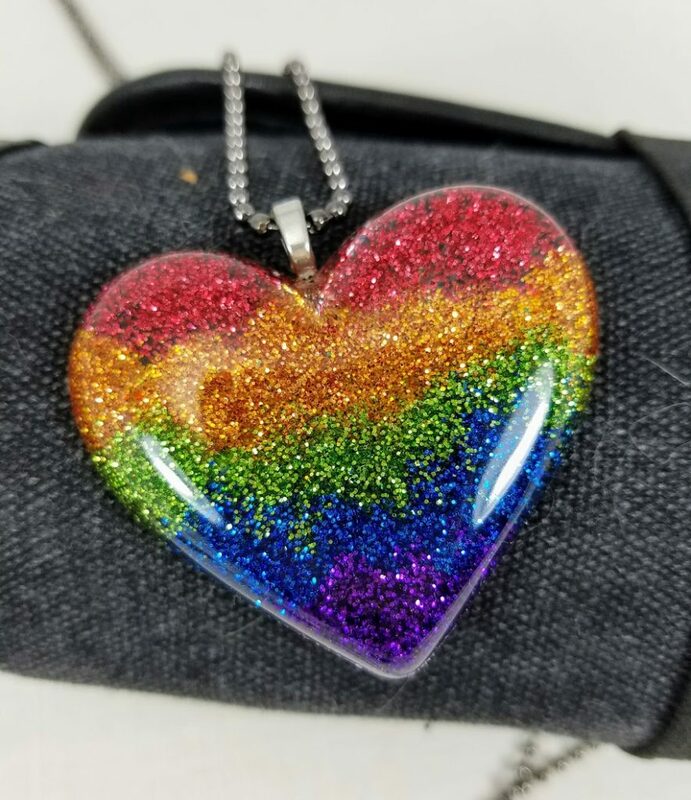 I made up a batch of amazing rainbow glitter heart necklaces to sell at St. Pete Pride….then I got food poisoning and had to miss the show. 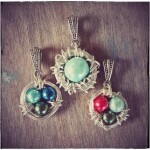 So I have some awesome necklaces that still need good homes. 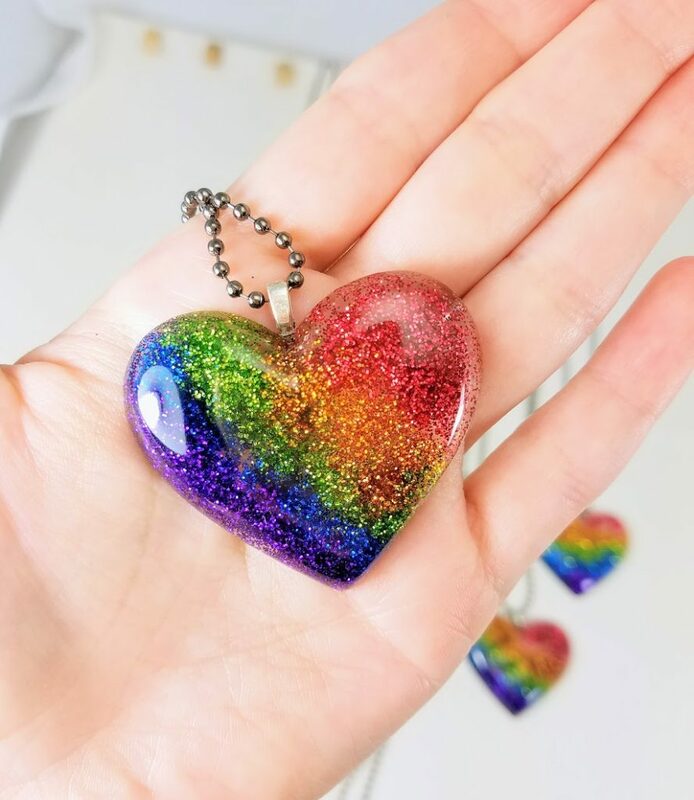 Each one was hand cast in resin embedded with rainbow glitter. The heart is shiny and puffy front with flat back. I’ve attached a silver bail and each pendant hangs from a 28″ gunmetal ball chain so you can easily slip it on and off right over your head. You can also hang it from a rearview mirror! I have four with horizontal glitter pattern (top row), four with diagonal glitter pattern (second row), and one with a mix of glitter (bottom row.) Each is $10 with $2.50 S&H to the US. First come, first served! Holy rainbow glitter Batman! This batch has officially sold out! But Don’t Panic! I can make up another batch. These will ship in approximately 2-3 days as I need time for the resin to cure. I’m opening this up to 9 more pre-order hearts to ship later this week. Thank you so much for your support! 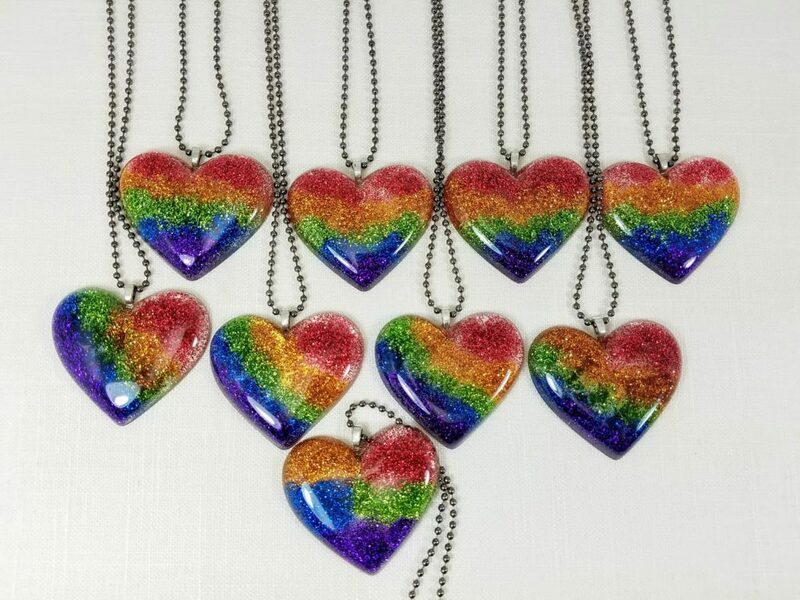 PhoenixFire Designs is an all-inclusive business and supports equal rights to all people and strongly believes #loveislove and #lovewins We are honored to have been a part of St. Pete Pride in previous years and will continue to support the LGBTQ+ community and create custom jewelry to honor that support. 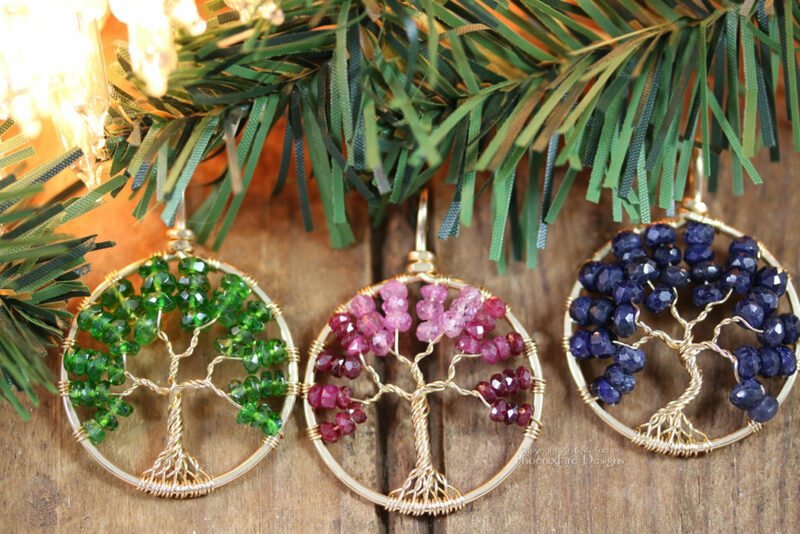 After years of customer inquiries, we finally have made some brand new, extra large tree of life SUNCATCHERS! 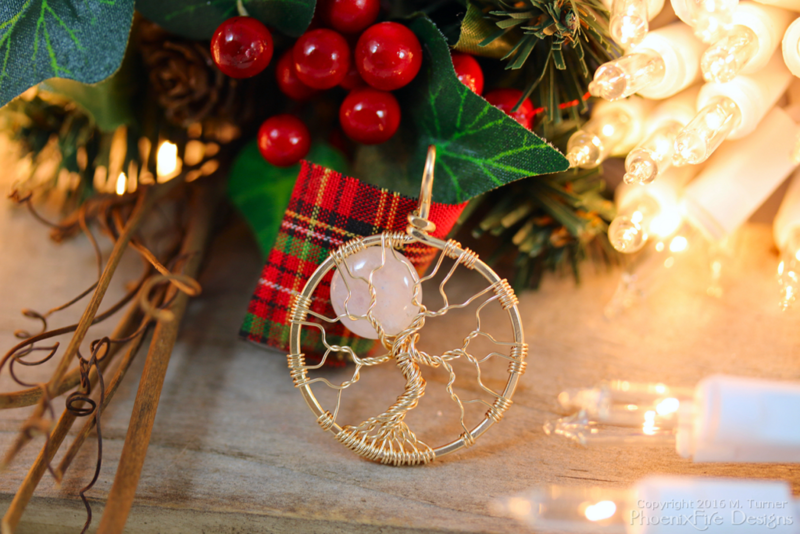 These amazing, wire wrapped trees are handmade, just like their smaller pendant cousins, but in a massive 8″, 10″, and 12″ scale! 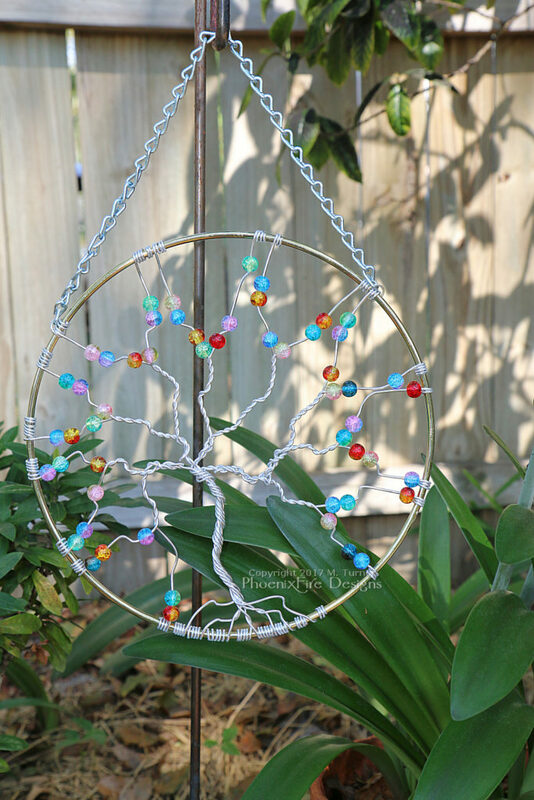 Silver anodized aluminum wire wrapped tree of life 8″ suncatcher with rainbow glass fire cracked beads, perfect garden art, or handmade wall art for your home. By PhoenixFire Designs. 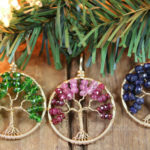 Tree of Life Suncatchers look amazing in a sunny window in your home, or a beautiful and unique accent to your backyard garden. Need unique accent for your rustic wedding, or inspiration for a woodland wedding? Or maybe you just need a perfect gift for Mom this Mother’s Day. Well, look no further! 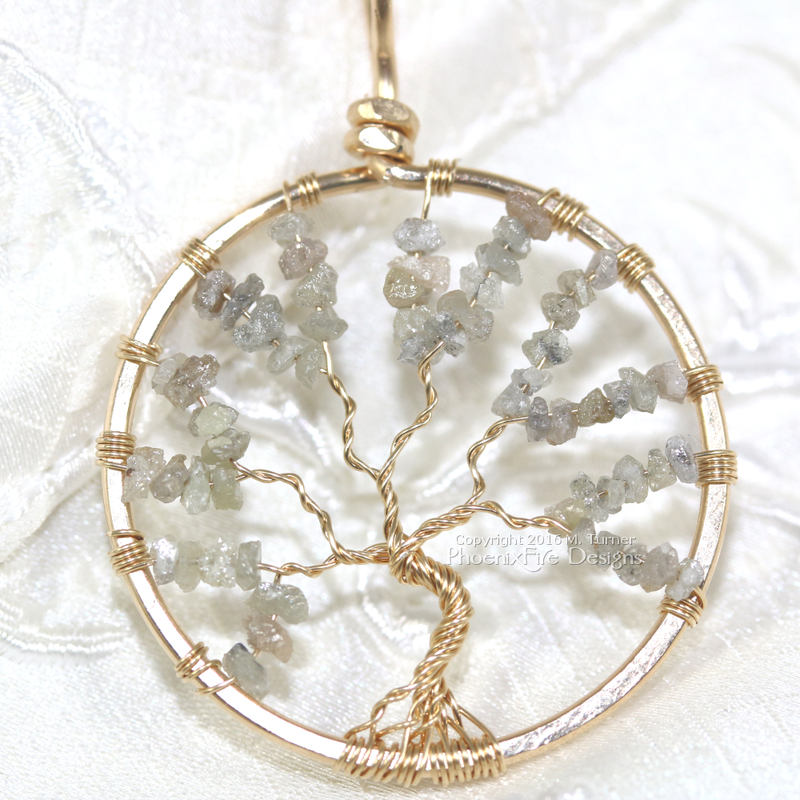 ve been making small, necklace sized tree of life pendants for over 10 years now and in fact, I’ve become quite well known for them! 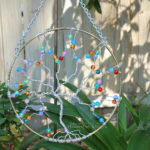 But I’ve had people inquiring about larger, decor versions of them for a long time; a suncatcher for your sunny window, or to hang as garden art in your backyard. Well, I’m happy to announce I’ve finally done just that! 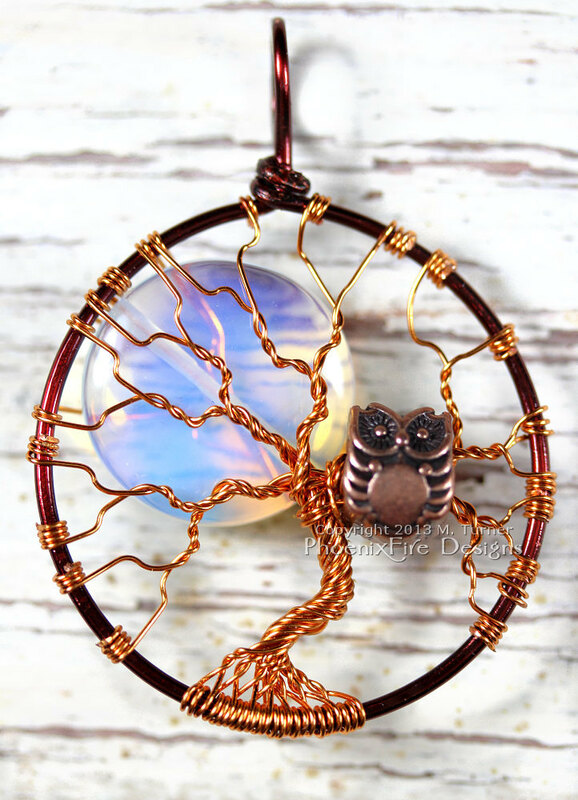 …or jump straight to the Suncatchers and Garden Art category on PhoenixFire Designs etsy shop to snag your very own, one of a kind garden art! Let us know what you think! Since this is a new product, we’d love your feedback and your ideas of how you’d like us to expand this concept. 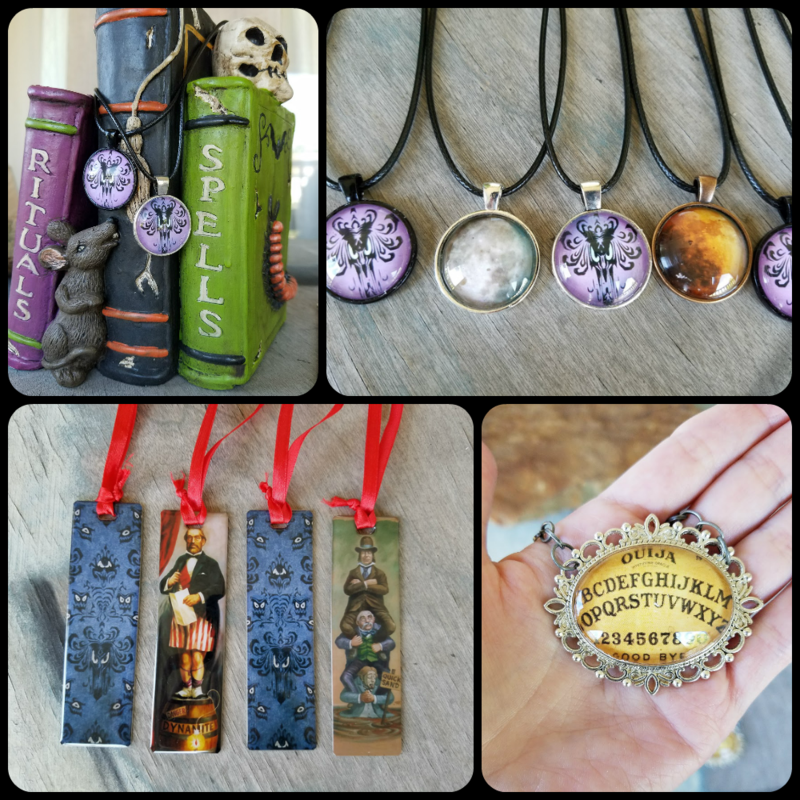 I made up a selection of limited edition Halloween jewelry for PhoenixFire Designs participation at the amazing Hauntizaar 2016 event. I have a handful of odds and ends leftover from the show and it’s all for sale at discounted price – first come, first served! Available while it lasts on the PhoenixFire Designs Facebook page! Do you realize that Mother’s Day is less than a month away? So what do you get for Mom? What are good gift ideas for Mother’s Day? Today, we’re going to look at some handmade gift ideas for her to help you find the perfect gift for mom! 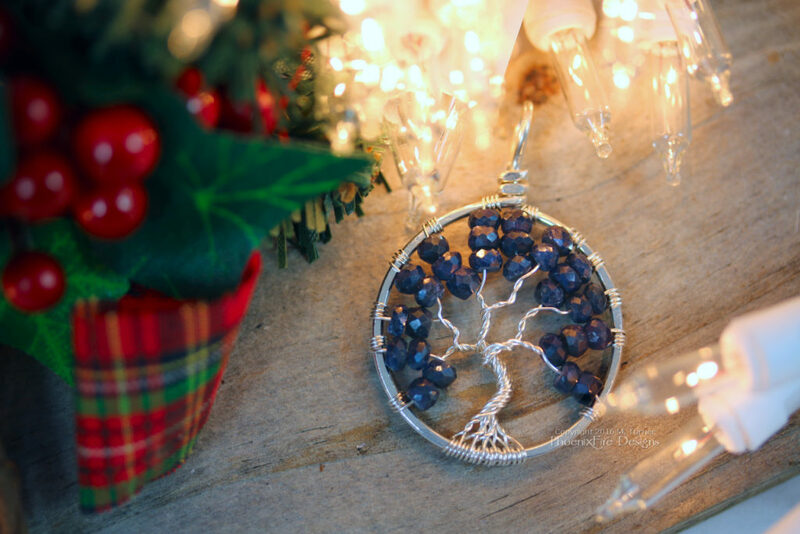 Or, if you have a bigger family or are looking to celebrate an entire family, why not look to my Family Tree of Life pendant? 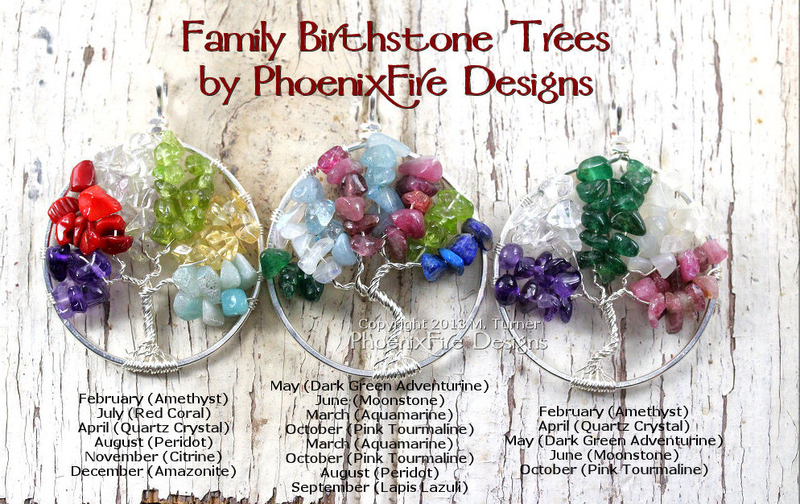 Made from up to 12 personalized gemstone birthstones, arranged in the order of your choosing. 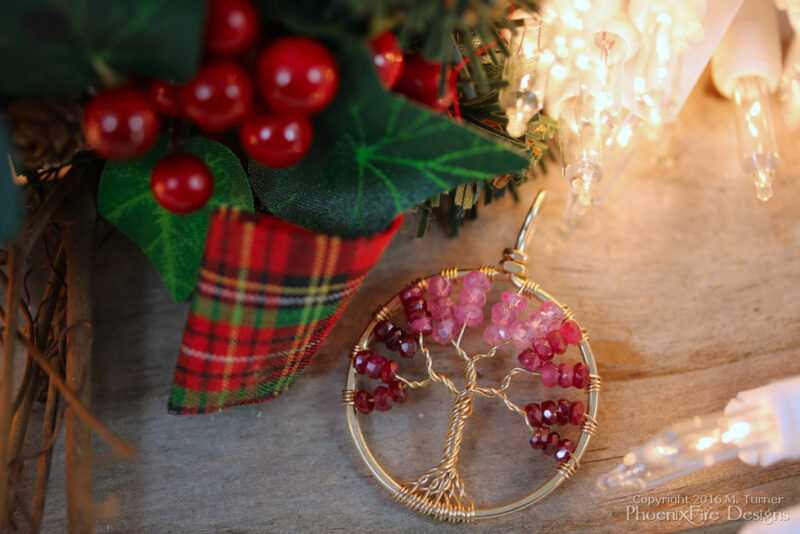 This wearable artisan pendant is the perfect way to celebrate family. 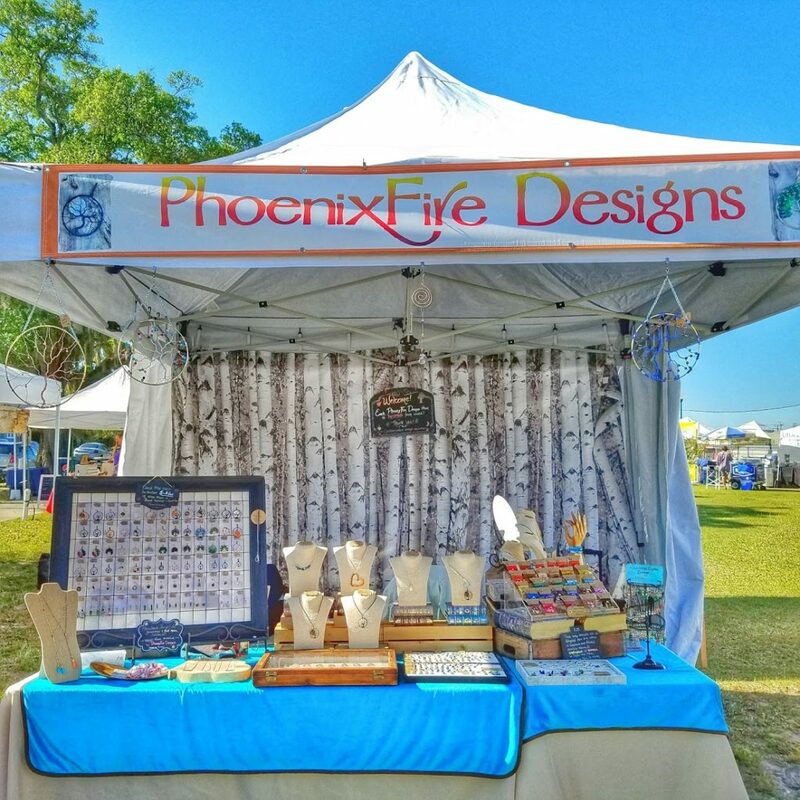 So when you’re trying to find the perfect gift for Mom, want to give mom something OOAK and special, need to give her something truly meaningful, and want the uniqueness of a handmade piece of custom jewelry, come to PhoenixFire Designs and shop our gorgeous collection of handcrafted artisan jewelry. Don’t see what you want? No problem! We’re always happy to customize, personalize or work with you to make the perfect, one of a kind gift! Give her something meaningful and thoughtful that she can cherish. 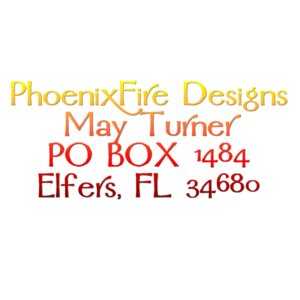 PhoenixFire Designs has offered quality, beauty and luxury on etsy since 2006! Shop with confidence. Hello my Happy Haunts! Welcome to October. Now is the time when ghosts are present, practicing their terror with ghoulish delight! I don’t mean to frighten you prematurely, so I am going to give you a TREAT rather than a trick. 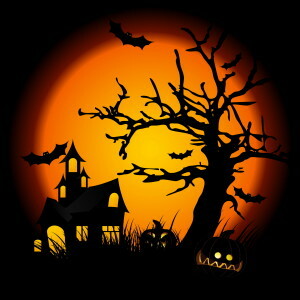 Spooky trees, Halloween harvest moon, glow in the dark jewelry – all of it is on sale for a limited time. 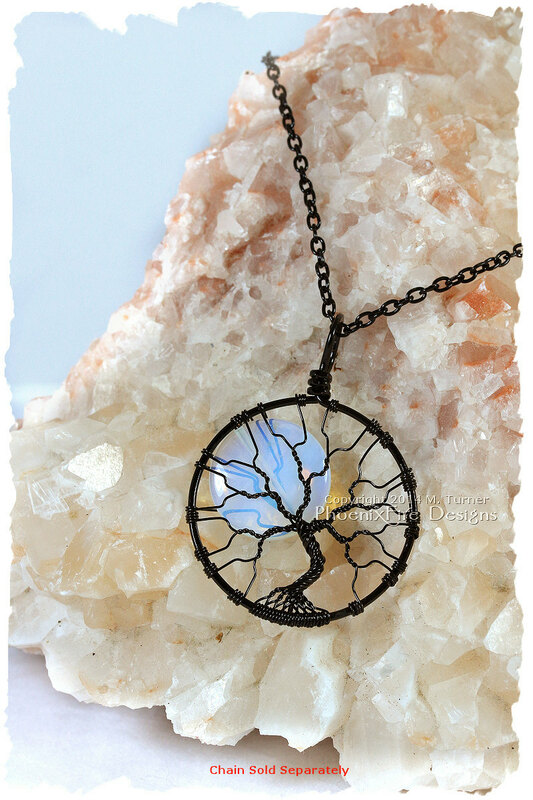 Handcrafted, wire wrapped tree of life pendants by PhoenixFire Designs. 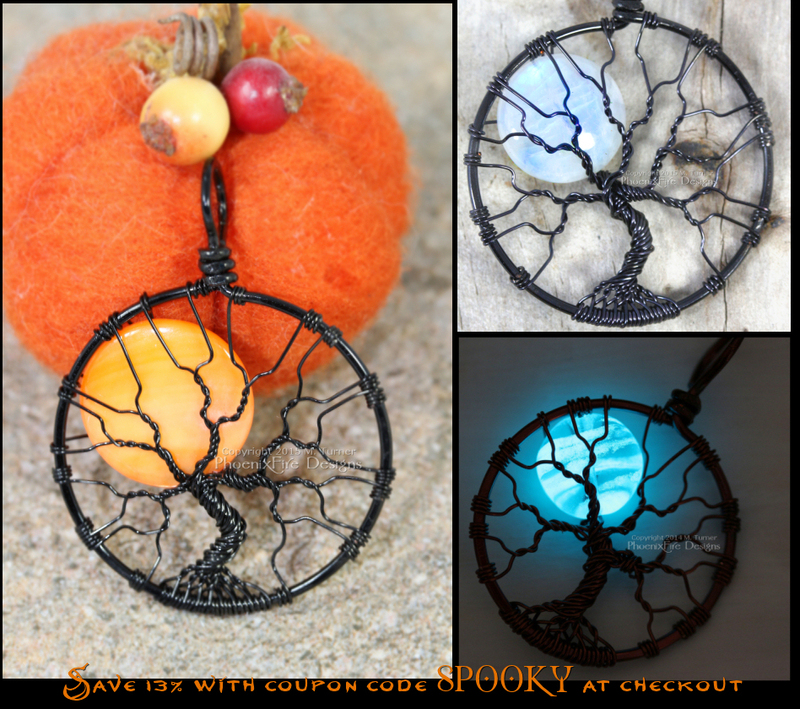 From October 1st – October 4th, save a frightening 13% off ANY PhoenixFire Designs order of $20 or more instantly when you apply code SPOOKY13 at checkout. 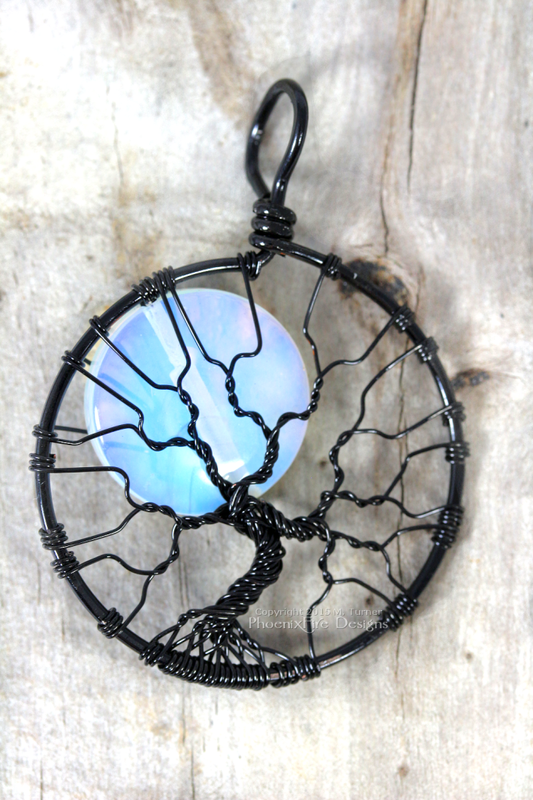 Handcrafted black wire wrapped opalite rainbow moonstone full moon tree of life pendant – the best seller by PhoenixFire Designs on etsy. 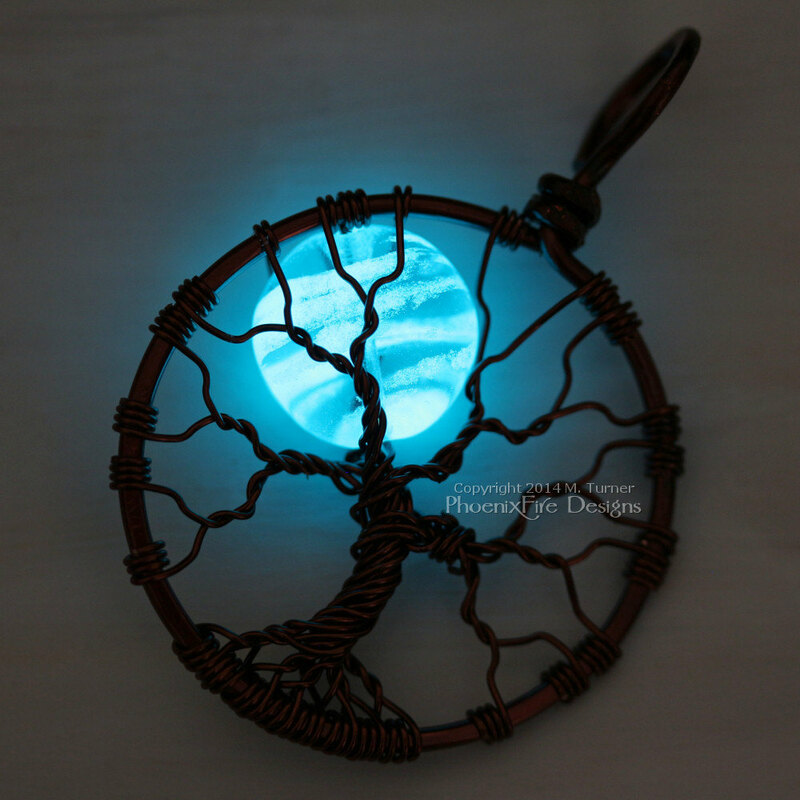 Have you had your eye on my #1 best selling and #1 most favorited item, the black wire wrapped opalite rainbow moonstone full moon tree? Now is the time to save! 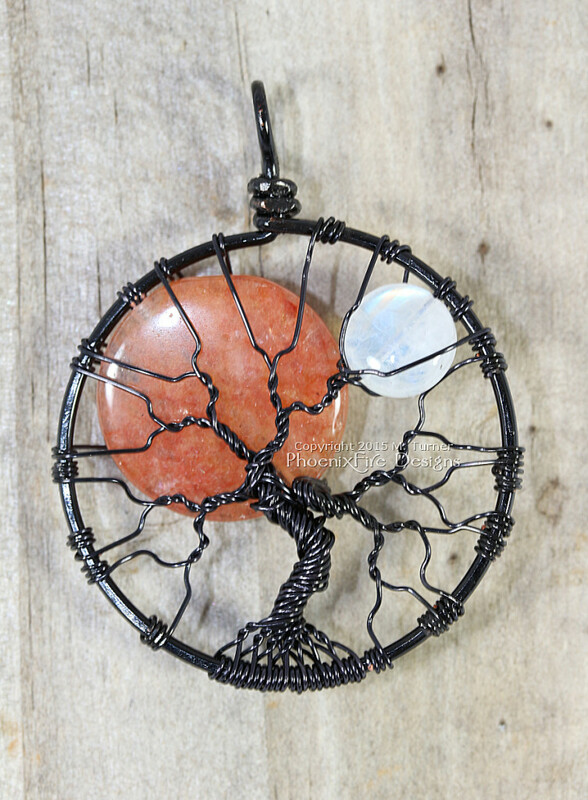 Large, orange opal sun and small rainbow moonstone moon rest together in this black wire wrapped tree of life pendant by PhoenixFire Designs. Hurry! This offer vanishes October 4th…. 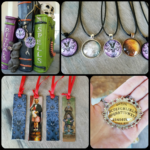 Shop PhoenixFire Designs on etsy now.